The Google Nexus 7 is probably the best Android tablet for the price out there. Good build quality, impressive 7 inch screen makes it a great tablet offering a great bang for your buck. The Nexus 7 Tablet is Google's response to the growing tablet market. Apple's iPad which is dominating the tablet market, although the Nexusmore resembles the Kindle Fire HD on price and performance than the iPad, and Google have seen that the Kindle has wiped all Google services in favor of Amazon's. It looks like they want their market back by offering a low cost, high-spec tablet of their own. The Nexus is manufactured by Asus rather than Google, but they have made an affordable and reasonably high-spec tablet running on the latest Android OS, a 7 inch screen in 16:9 aspect ratio makes it perfect for video and streaming. The Nexus is tied into the Google content ecosphere. You get one key access to the Google Play store supplying books, apps, music and of course, movies. 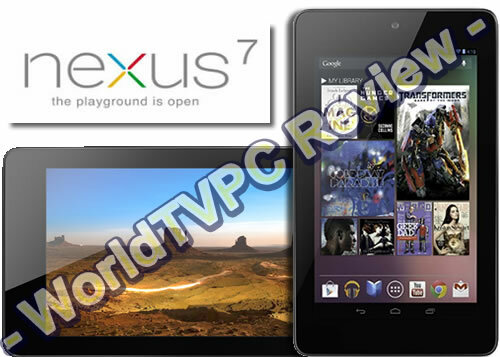 Google have chosen Asus as their partner to manufacture the Nexus 7 giving it a good solid build quality thats light to the touch. It looks like any other 7 inch tablet being a plastic and metal rectangle, much like a big smartphone. The tablet has a single front mounted 1.2 megapixel camera.The quality is definately not iPad quality, but then neither is the price. At the center bottom is a micro USB socket for both charging and/or data transfer, a headphone socket and on the right side top is the volume switch and power/screen button. The back is soft matt plastic. Size wise the Nexus 7 is 199 x 120mm, and 10.5mm thick. The Nexus 7 is pretty well set-up for streaming boasting a 7 inch IPS display, 1.3GHz Nvidia Tegra 3 quad-core processor, 1GB of RAM, all running with the 4.1 operating system. Storage of 8 or 16GB means there is not so much room to store downloaded video though, and no way of upgrading using an sd card. Playing video on the Nexus runs perfectly even at 1080pHD resolution on a screen of 1200 x 800 and a pixel density of 216ppi. We tried running several streaming services such as Netflix, Hulu, Spotify for music which all streamed perfectly over a WiFi connection. Streaming of movies and TV shows was pretty much perfect. The battery manages to give over 8 hours of video playback with half level of brightness which is pretty good. Sound quality is surprisingly good especially when looking at the tiny speaker grille, although it is not as good as the ipad and any stereo effect seemed to be lost. Connection wise, you have WiFi, Bluetooth and NFC for home networking with selected devices. But the big missing feature is any 3G connection, so no internet whilst on the move - unfortunately. Whilst playing video and streaming is smooth, some videos will not play due to lack of support for a lot of codecs. Downloading a video player from the app store will sort out that particular problem though. The Nexus tablet runs on the latest Android OS version 4.1 also known as Jelly Bean. For video users it is easily the best version thanks to the "triple buffering in the graphical pipeline" improving framerates and allowing several apps to be open at one time. The Downsides are the lack of any 3G connection, which may put off some, and you only get one camera. You can download a number of movies, use Netflix, Hulu and Amazon as well as a number of catch-up TV services. Whilst Google Play is no iTunes beater, there are a number of movies to download or rent. The simple fact though is that in most respects the iPad outperforms the Nexus in hardware and software terms, but then Apple have been in the game a bit longer.